BEST Christmas Ever • Run Hard. Rest Well. Do you want to enjoy THE best Christmas ever – no matter your exhaustion, your bank account, your panic? Ask yourself these three questions and write down the answers. List 3 Christmas things that give you great joy. 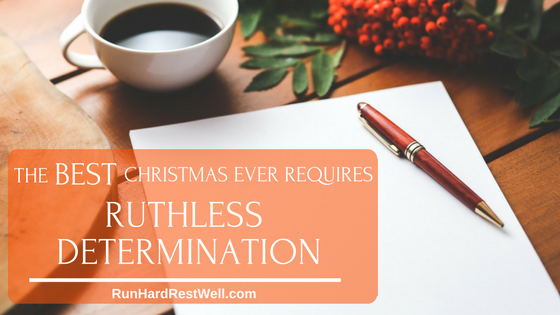 List 3 Christmas things that leave you drained, depleted and irritable. List 3 Christmas things that makes your heart beat hard for Jesus. Do it. Grab a pen. Think it through. Take the time. Now – free, ruthless and determined . . .
√ Star or circle the items that will make this THE best Christmas ever. Now, share this list with someone who knows you and loves you. Talk it through. Share your fears. Share your hopes. Share your heart’s desire for something more this Christmas. Then – commence, move forward, advance into the BEST Christmas ever, with eyes dancing – dancing with joy for the Advent journey before you. Thanks so much for sharing this simple way to put the joy back in Christmas! God’s blessings to you and yours this Christmas! It’s a really powerful thing to do with a small group Bible study. There’s something about writing it down, sharing and hearing other people’s joys and strains. It encourages us to reclaim Christmas for Jesus…in our hearts. Praying your Bethlehem journey is full of joy, peace and quiet! Boy, Brenda, you’re sending some tough stuff. Right now I’m struggling physically and emotionally. Because of the holidays? Maybe. Because of the cold? And no, cold here doesn’t touch cold there. Maybe. Right now all I know is that unless Jesus shows up for Christmas, it can’t be joyous. Will He show up? Yes, and everything will be good, but today……well, I’m just not going to think about that. Betty, I am praying Jesus does not wait! That He comes today — in all tenderness, power, grace, peace and love……..
to you and to me, in the middle of our messes and messiness.